I told her, “I don’t know, Ma. I only know that I need to paint it exactly the way it has been given to me to do.” I have subsequently learned that fishing canoes are, more often than not, rigged on the right because more people than not are right-handed. They rig for their personal convenience and not because of some tradition. The physical setting is the open ocean out from Honolulu Harbor looking towards Ewa. The model for the steersman in the canoe is modern day legend, Nappy Napoleon, my coach from Änuenue Canoe Club. The middle paddler is me. It is you. It is “everyman” – and the stormy sea is the sea of life. 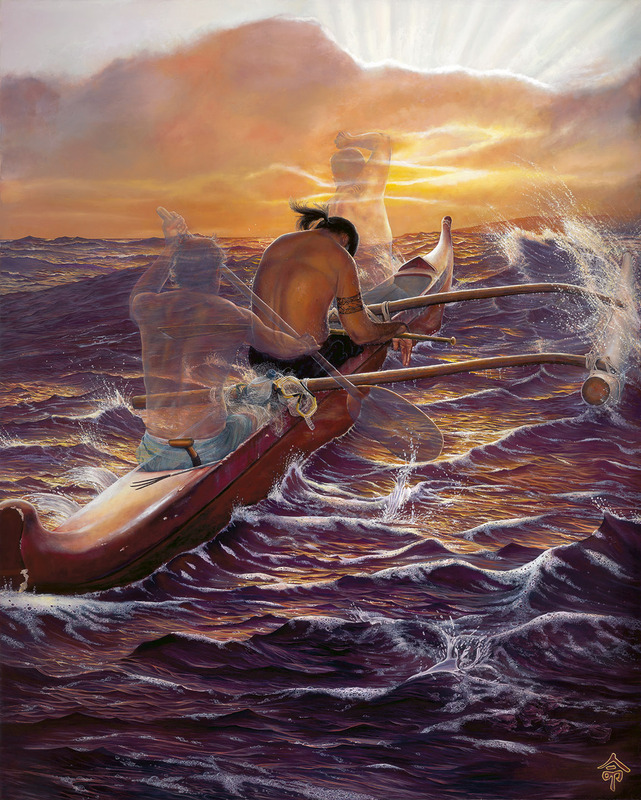 It is appropriate that the face of the middle paddler not be seen because the power of this painting lies in its individual message to each viewer. Every person will sooner or later in life experience that middle seat. Just remember, there is always hope. There is always guidance. There is always help. Mai poina ‘oukou i nā ‘ānela. Don’t forget the angels.